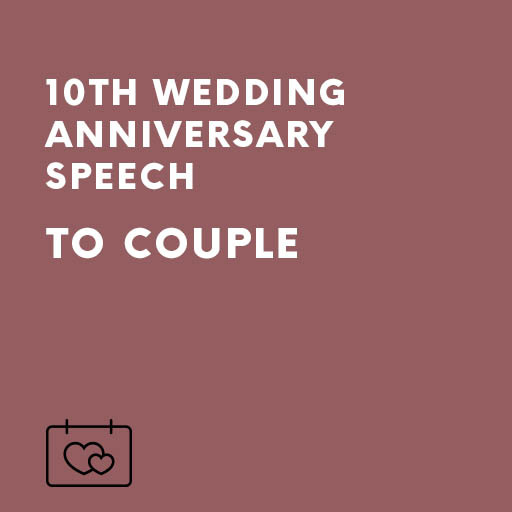 These 10th wedding anniversary speeches are ideal if you wish to congratulate a couple who are celebrating their tin/aluminum wedding anniversary. They speak of times past and hopes for the future. They speak of the joys of married life and the challenges. They end with an appropriate anniversary toast. The short poems offer you the opportunity to end your speech on a different note. Any husband and wife who survive 10 years together in this day and age are doing well, as you will point out in your 10th wedding anniversary speech to couple. As a guest or family member, with the help of these tin/aluminum wedding anniversary speeches, toasts and poems you’ll speak with compassion of times past and hopes for the future, of the joys of married life and the challenges. You will end your 10th wedding anniversary speech to couple with an appropriate anniversary toast and perhaps one of the brief apt poems provided.